Romantic Tutu by Noé & Zoë made from double layer tulle. The light and airy skirt in rose makes every little girl become a pretty ice princess. Also available in black. Since 2011, Noé & Zoë has been manufacturing stylish children’s wear in Berlin. The fabrics often look hand printed and bring an unconventional look to any wardrobe. The Berlin children’s fashion label has its shop in Rykestrasse, Prenzlauer Berg, not far from the famous water tower at Kollwitzplatz. As typical for Berlin’s creative scene, the shop is located hidden in a backyard. Here, the designer and founder Nici Zinell has captured the trends of time, supported by her team of employees. 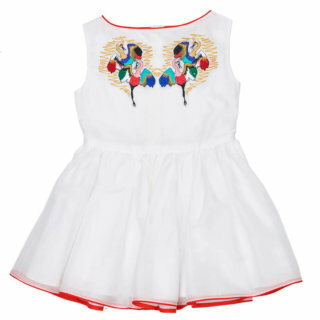 The range of products goes from cool Baby’s and Children’s Fashion to accessories and homewear. The fabrics are of timeless beauty and neon tones set trendy highlights in the color palette.